The two countries have diverging views on boosting their military efforts. Summary France and Germany are growing further apart. When it comes to their approach to security threats, military operations and spending priorities, the two countries increasingly diverge. The differences between Paris and Berlin underline Europe's fragmentation. One day before a joint meeting of French and German officials on April 7, French President François Hollande said in an interview with the German newspaper Bild, "Our two countries must agree to a budgetary effort on defense. And to act outside Europe. Let's not rely on another power, even a friendly one, to do away with terrorism." This is a statement that requires serious consideration. The European Union was built on a core concept. The origin of European conflict, going back to 1871, has been the divergent interests of France and Germany. The post-World War II solution was to integrate the French and German economies so deeply that political divergence became impossible. The European Union has lost its cohesion, and the alignment between France and Germany is holding it together. The union is not what it once was, but so long as these two countries retain a fundamental alignment, it is reasonable to say that all is not lost. However, relations between the two countries have come under strain, and anything that adds to the existing tension raises red flags. The statement made by the French president on the eve of a meeting with the Germans to showcase harmony is a red flag. The attacks in Paris and Brussels have posed a fundamental question for France. It cannot simply accept this threat, but must do something about it. There are two parts to dealing with this threat. First, the conflicts that are raging in the Middle East must be brought under some control. Second, the issue of radicalization in Muslim communities must in some way be addressed. In the Bild interview, Hollande made the latter clear, although how he will respond to this issue is uncertain. But for the French, building a European military force around France and Germany is the necessary precondition for any solution to Europe's growing challenges. This goes counter Germany’s fundamental sense of self and its interests. For Germany, building a military force after World War II has been problematic. It had one during the Cold War, but in many ways it was not under Germany’s command but NATO’s. It did not have the feel of a resurgent European military because it was, in the end, the junior partner of the United States. Hollande specifically said that France and Germany could not depend on a third power, no matter how friendly, to fight their battles. He clearly was referring to the United States. Collaborating on defense budgets, with each nation contributing based on economic size, would mean that Germany would be both the leading economic and military power in Europe. Within the EU, Germany is first among equals. Creating a substantial military force would cement that. And that raises for Germans the specter of a return to what must never be again. There is another reason for the divergence between the two countries, which explains why the French are not more frightened of this proposal than they should be. The French want an expansionary budgetary policy, while the Germans want to restrain spending. Defense spending would generate budget deficits, but this would also stimulate Europe’s economy. German unemployment at the moment is 4.5 percent, while France’s is much higher. Germany, at full employment, fears inflation, but France fears stagnation. There is a psychological divergence as well. The French are responding to terror attacks with a sense of helplessness. The Germans have not been attacked in the same way and are more sanguine. This reminds me of the U.S. response to 9/11 and the European sense at the time that the U.S. was overreacting. The schism between those who have been victimized and those who have not is profound. One must act, while the other sees no urgency and cautions prudence. The implicit reference to the United States is also important here. France is acknowledging that Europe cannot simply rely on the U.S. to fight wars with the jihadists. Indeed, the U.S. has shifted away from multidivisional ground combat. We can see that in Syria. The Americans have learned that it is easy to defeat a conventional military force, as it did in Iraq. However, the Iraqi military fragmented and evolved into a resistance that would require massive force to even attempt suppressing. The United States simply does not have a force of that size. It will not engage on the ground in Syria, confining itself to special operations and airstrikes. In a way, the Americans have learned the lesson the French have been trying to teach them since 2003. But on the other hand, the French have now learned the reality the Americans have lived with since 2001. Rather than jump at every loose comment and respond to every new prime-time provocation, it makes sense to place India’s Pakistan conundrum in the context of a broader neighbourhood policy. This indicates the challenges that successive Governments have wrestled with, and point to a trend that all parties deny in opposition but all Governments in some manner endorse. Economic reform and liberalisation in 1991 had an immediate impact on India’s external outlook. However, its effect on neighbourhood policy was not instant. The initial outreach was to stronger economies and investment sources in Southeast Asia (‘Look East’) and in the West, encompassing early efforts at a post-Cold War rapprochement with the United States. However, the insurgency in Kashmir valley, the dispersal of pan-Islamist jihadis from Afghanistan and the final chapter in Punjab’s decade of terror meant no meaningful engagement with Pakistan, and by extension no meaningful South Asian compact, was possible. It was only by the late 1990s that the impetus to improve India’s relations with the neighbourhood was felt. As the economy gradually became more integrated with the global system, there was the realisation that India couldn’t really bypass South Asia, and that its ability to reach its potential as an economic actor, a safe and credible business destination and a regional and Asian power was to a substantial extent dependent on establishing a certain equanimity in its near neighbourhood. Of course, this had to be done without compromising the ability to anticipate and deter terrorism resulting from growing religious radicalism in Pakistan and Afghanistan and to a degree Bangladesh as well. Most important, both India and Pakistan had crossed a critical nuclear threshold and even before the Pokhran and Chagai tests of 1998, it was clear that the autonomy of action (or inaction) that India had enjoyed in its bilateral relationship with Pakistan would be circumscribed by global concerns about the arrival of two putative nuclear powers in the subcontinent. India needed to take the initiative, because that was expected of it as the region’s obvious leader. How exactly would such an initiative be packaged? The first response came in 1996-98, in the two years of the United Front Government, with IK Gujral as External Affairs Minister and then Prime Minister. His ‘Gujral doctrine’, as it came to be known, saw India make a series of unilateral concessions to its neighbours without any expectation of reciprocity. Generous as this was, it was not viable as it did not have an adequate domestic political constituency. Aziz Haniffa/Rediff.com reports from Washington, DC. 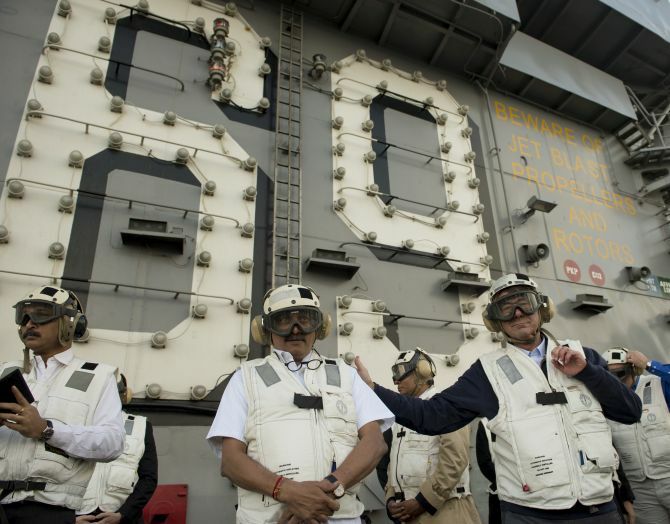 United States Defence Secretary Ash Carter Friday, a day before emplaning for India, strongly indicated that some significant defence and military agreements on US-India co-production and or co-development, may be on the cards during his three-day visit. In his remarks to the Council on Foreign Relations, Dr Carter, who conceived and pushed through the US-India Defence Technology and Trade Initiative during his earlier incarnations at the Pentagon, said, "While I am in India, I will meet with Prime Minister (Narendra) Modi and Defence Minister (Manohar) Parrikar to discuss the progress we have made together in aircraft carrier, jet fighter, and jet engine collaboration." "And we will talk about exciting new projects, the details of which I cannot got into this afternoon, but stay tuned for when I'm with Minister Parrikar," he added, to chuckles from the audience. "Last year, the Modi government reached out to the United States to discuss the possibility of launching joint production on a new platform -- to build on the work Lockheed Martin and Indian industry achieved on the C-130J project and what Boeing and the Indian industry will achieve on the production of Apache and Chinook helicopters India recently purchased," Dr Carter noted. Members of his team and industry were right now in India, Dr Carter disclosed, "looking at the potential co-production of fighter aircraft." "These conversations represent the growing enthusiasm of the US-India partnership,' he added, "and even more than that, its promise." Wile acknowledging that "these negotiations can be difficult and global competition is high," Dr Carter declared that he had "no doubt that in the coming years, the United States and India will embark on a landmark co-production agreement that will bring our two countries closer together and make our militaries stronger." US Secretary of Defence Mr Ashton Carter is due to visit New Delhi on 10 April. Carter has earned the reputation of being the most pro-India head of the Pentagon in recent years if not all times to come. He is seen as the principal architect of the US-India Defence Technology and Trade Initiative (DTTI). DTTI has made some preliminary strides in identifying possible key projects in the past two years. Indian media including The Hindu, which is known for being left of centre is abuzz with the news that India and the United States will be signing the three foundational agreements, Communications and Information Security Memorandum of Agreement (CISMOA), Logistics Support Agreement and Basic Exchange and Cooperation Agreement (BECA). There are other reports that minimal achievement during the Carter visit is likely to be the Logistics Support Agreement (LSA) suitably modified to meet some of the Indian concerns. The Secretary of Defence comes well armed with a Bill that has been introduced in the US Congress for institutionalising India-US Strategic relationship. US-India Defence Technology and Partnership Act (HR 4825) has a larger purport with the Bill stating, “The President is encouraged to coordinate with India on an annual basis to develop military contingency plans for addressing threats to mutual security interests of both countries”. The Bill also calls for developing strategic operation capabilities, defining these as, ‘‘strategic operational capabilities’’ means the ability to execute military operations of mutual security interest while sustaining minimal damages and casualties, through the use of military means, possessed in sufficient quantity, including weapons, command, control, communication, intelligence, surveillance, and reconnaissance capabilities”. Congressman George Holding, Co-Chair of the House India Caucus who has proposed the Resolution states, "This legislation will cement the process that has already been made and will lay a foundation for future cooperation and growth." While the Bill is under consideration, its initiation will provide Carter, a strong hand in suggesting the United States long-term interests in a defence relationship with India overlapping administrations with Congressional oversight. There have been extensive preparations made ahead of the Visit. Secretary Carter in his remarks at the Center for Strategic and International Studies,” Breaking New Ground: Preparing DoD for the Future,” on 5 April 2016 when asked about the trajectory of defence relations with India given that he has invested a lot of time in the same was pragmatic. In India, Ukraine is looking to grab a piece of the market dominated by Russia in the servicing and repair of Soviet-era equipment. However, the recent scandal in Croatia around the delivery of faulty Ukrainian MiG-21s should force the countries that own Soviet tech, India included, to carefully consider whether the hunt for low prices is worth it. "Ukraine is making aggressive moves to break the Russian monopoly on cooperation with India over the repair and maintenance of [Soviet-era] military equipment," Russia's Gazeta.ru newspaper notes, citing a report by Defense News on the Ukrainian delegation's efforts at Defexpo India 2016, one of the leading global exhibitions of arms and military equipment. Petro Fedoruk, the chief adviser to Ukroboronprom, Ukraine's largest defense industry consortium, told Defense News that Ukraine is looking to push Russia out of its monopoly position in the repair of Soviet equipment. "We are here now [in] India for the long term to manage Soviet-era headaches, which India cannot manage alone," he said. "For nearly a decade Russia has forcefully blocked our entry," Fedoruk added, referring to a decline in Ukrainian-Indian military cooperation in the late 1990s, after Kiev sold Pakistan, Delhi's long-time military adversary, a large shipment of T-80 tanks. At the same time, he noted that Ukraine had "offered multiple solutions to give new life to Soviet-era weaponry, as we are the original equipment manufacturer." Now, Defense News writes, "armed with salutations of a government-level delegation…and with over a dozen defense companies showcasing new programs at Defexpo, Ukraine is attempting to embrace India and break the Russian monopoly on the Soviet-era platforms." Delhi, members of the delegation suggested, may be interested in the low-low prices offered by Ukraine. For example, Ukroboronprom naval projects head Nikolai Gordienko told the daily, "we are offering a new solution to manage and refit the Soviet-era aircraft carrier Admiral Gorshkov, which is 50 percent cheaper than the Russian offer." The Admiral Gorshkov, commissioned by the Soviet Navy in 1987 and transferred to the Russian Navy after the Soviet collapse, was sold to India in 2004, and commissioned into the Indian Navy in November 2013, rechristened as the INS Vikramaditya. The ship underwent extensive upgrades at Sevmash Enterprise in Russia's Severodvinsk before the handover. Now, Defense News reports, "the Indian Navy is evaluating a proposal by Ukraine for the overhaul and maintenance of gas turbines used in Delhi-class warships and the carrier Admiral Gorshkov." ** Will Russia and China Become Allies? Summary: The idea that Russia and China are going to become close allies fails to account for the constraints and geopolitical imperatives of both countries. Neither can be content in a situation where the U.S. has untrammeled power in the world. But that does not change the geography that makes the interests of Beijing and Moscow so different. In this case, the enemy of my enemy is not necessarily my friend. The United States is the world's dominant power, and is without peer. But Russia and China are arguably the next two most significant world powers on the list. Russia's economy may be in shambles, and it is in the process of updating its military and rearming for 21st century conflict - but even so, Moscow boasts a formidable arsenal of nuclear weapons and just demonstrated in Syria how effective a limited deployment of Russian troops can be. China now has the second largest GDP in the world, and convulsions in the Chinese economy have global ramifications, as the crisis of the exporters has demonstrated. 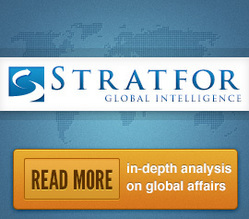 U.S. relations with Russia and China have become tense in recent years. The American "reset" of relations with Russia froze with the Ukrainian revolution of February 2014. The U.S.-China relationship is less hostile: there has been ostensible progress on economic issues, on isolating North Korea and levying sanctions against Pyongyang, and even on issues related to climate change. But China's saber rattling in the South China Sea is a challenge for America's Asian allies and a nuisance to the U.S. Nor can the U.S. be comfortable with Chinese President Xi Jinping's moves to affirm his status as Chinese dictator. On the surface, it would make sense for China and Russia to marry their fortunes together. An alliance would create exactly the type of Eurasian force that U.S. policy is designed to thwart. But here, geopolitics asserts itself. That Russia and China might seek to increase cooperation to the point of becoming allies is not a red herring argument. On both a macro and a micro level, relations between Russia and China are arguably better today than they have been at any point since World War II. Since the fall of the Soviet Union in 1991, Sino-Russian relations have improved markedly. The 1991 Sino-Soviet Border Agreement settled many territorial disputes between the two countries - the last of these disputes was addressed in a 2004 agreement that dealt with the eastern section of the border. In 2001, China and Russia signed a Treaty of Friendship, a 20-year agreement that not only provides the basis for peaceful relations, but also has been interpreted as an implicit defense pact. The countries' ties have accelerated in recent years in three areas: energy, finance and infrastructure/technology. Russia and China flirted with energy cooperation in the past, but in 2013 the two sides signed a number of deals, including a $270 billion oil deal and a joint venture between Rosneft and China National Petroleum Corporation that constituted Russia's first attempt to break into China's gasoline market. Overall, according to the Bank of Russia, Chinese foreign direct investment into Russia increased by a factor of five from 2009 to 2014. The 2008 financial crisis hit Russia hard and would turn out to be a harbinger for more serious problems to come. Russia once bragged it could survive if oil prices dipped as low as $70 a barrel, which now seems like wishful thinking. The recent March "rally" in oil prices to $40 then just made a catastrophic situation a little easier to swallow. Meanwhile, Moscow's underestimation of the crisis in Ukraine and the subsequent sanctions tacked on after Russia formalized its rule of Crimea drove Russia to look east more than it had in the past. In May 2014, Putin signed a bevy of agreements, though many of these have not moved forward at the anticipated pace. More important for Russia is financing - and this also has picked up. Just last month, Gazprom secured a $2.17 billion loan from the Bank of China, and according to the Bank of Russia, new Chinese loans to the non-financial sector and households in Russia in 2014 totaled $11.6 billion - almost four times as much as Russia's next biggest lender. Five of you remain with less than 31 weeks until Election Day. Three of you won't even make it out of the primaries. And yet, American voters and foreign observers all search for substance in your stump speeches, trying to imagine their lives and the world at large under your leaderships. Those of us who view the world through the prism of geopolitics remind ourselves that campaign rhetoric tends to diverge from post-election policy. The constraints built into the presidency as well as those shaping the international system will inevitably blur personal distinctions and mold policy decisions, whether the winning candidate carries anti-establishment credentials to Washington or is working to create or uphold a political dynasty. We understand that perspective is hard to come by at this stage of the race, and you are obsessively watching the polls and attempting to shape your image to a media ready to pounce on every slip. But the world is watching at a time of great uncertainty. Candidates will require dispassionate analysis and a deep understanding of history to navigate the challenges that lie beyond our borders. Whoever enters the White House come January, this briefing attempts to frame the geopolitical state of the world awaiting you. While it is easy to blame presidents for breaking the economy or credit them for fixing it, they will ultimately be judged by how well they manage the phase of the country's economic cycle that overlaps their time in office. It just so happens that the current phase of the cycle - the great global deleveraging - is comparable to that of the 1930s. Eight years ago, central banks reluctantly became the first responders to a world that had seized up after overindulging in credit-fueled growth enabled in large part by China's record rise. As debt repayments soared and global depression loomed, governments and central banks had no choice but to intervene. The painkillers came in the form of liquidity injections, large-scale purchases of market securities and a discomforting world of zero and negative interest rates, all in the hope of stimulating consumer spending to drive sustainable growth. As governments became more wary of their debt burdens and voters, they backed off, and the central banks were largely left to manage the crisis. And while central banks have lulled markets back into complacency and have bought political leaders time, growth engines are still sputtering, and income inequality has reached a point of political severity. The United States, less exposed to trade fluctuations than its peers, has been the first to recover and begin the process of normalizing its economy through a gradual rise in interest rates. But that strategy is sensitive to economic headwinds from abroad. The U.S. economy cannot operate in a vacuum, and the global dominance of the dollar stretches U.S. influence into nearly every corner of the world. And so while the U.S. president does not influence the Federal Reserve's monetary policy, the consequences of that policy reach around the globe. For example, a dovish Fed policy in raising rates will limit the damage inflicted on the Chinese yuan by a strong dollar, but that move simultaneously creates more problems for the euro and yen by pushing them higher in relative terms at a time when both the European Central Bank and the Bank of Japan are running out of ammunition. The more unorthodox measures that central banks must undertake to stimulate growth, the more political scrutiny they will face as their efforts decline in utility with time. If central banks cannot carry sick economies through the deleveraging process, then the more burden politicians will have to shoulder to find the right blend of spending cuts, wealth transfers and debt restructuring to pave the path toward rising incomes, productivity growth and inclusive employment. Hu Yaobang (deceased), who headed the Communist Party from 1982 to 1987: Hu’s son, Hu Dehua, was shareholder, director, and beneficial owner of a BVI company incorporated in 2003. Li Peng, former Premier: Li’s daughter, Li Xiaolin, owns a BVI company incorporated in 1994. She and her husband previously owned the entity via bearer shares, which obfuscate ownership. Zeng Qinghong, former Vice President: Zeng’s brother, Zeng Qinghuai, was director of a company incorporated in Niue, later shifted to Samoa. Jia Qinglin, former PSC member: Jia’s granddaughter Jasmine Li Zidan (no relation to Li Xiaolin) became the owner of an offshore company in 2010 and later came to own two BVI shell companies with total registered capital of $300,000. Xi Jinping, current President: Xi’s brother-in-law, Deng Jiagui, acquired three offshore firms over several years. Zhang Gaoli, current PSC member: Zhang’s son-in law, Lee Shing Put, owned shares in three BVI companies. Liu Yunshan, current PSC member: Liu’s daughter-in-law, Jia Liqing, was director and shareholder of a BVI company in 2009. Other notable Chinese clients of Mossack Fonseca who have not held high office include Shen Guojun, founder of a Chinese shopping mall chain, and Jackie Chan, the kung-fu star notable for his worldwide appeal and his full-throated expressions of fealty to the ruling party, including a 2009 statement that the people of China “need to be managed.” Shen and Chan, together with others, owned a BVI company incorporated in 2008. The report states neither Shen nor Chan responded to repeated ICIJ requests for comment. The Middle East and North Africa (MENA) is a region of extremes. It has the highest unemployment rate in the developing world, with the rate for women and young people double the average. Its economies are among the least diversified, with the Herfindahl index—a measure of the concentration of exports in a few commodities—ranging between 0.6 and 1 for most countries. The region had the highest number of electricity cuts per month. The ratio of public- to private-sector workers is the highest in the world. While, until recently, the region had been averaging 4-5 percent GDP growth, that average masked a highly volatile growth path. These extreme outcomes are associated with policies in the region before 2014. MENA is home to 8 percent of the world’s population, 5 percent of its GDP—and 48 percent of the world’s energy subsidies. These subsidies are an incentive to energy-intensive industries, which tend to have large, old firms. These firms don’t create many jobs; small, young firms do. So the subsidy to energy acts as a tax on labor, contributing to the high unemployment rates. Energy subsidies also reduce the ability and incentive to maintain the grid, leading to chronic power cuts. Diesel subsidies give an incentive to farmers to pump water, contributing to MENA being the most water-scarce region in the world. Finally, fuel subsidies induce people to drive cars more often. Traffic congestion along eleven corridors in Cairo alone costs the Egyptian economy $2 billion a year in lost competitiveness. In almost every MENA country, citizens working in the public sector are paid more than their private-sector counterparts. As a result, young people show a distinct preference for working in the public sector. In some of the Gulf Cooperation Council (GCC) countries, the government “tops up” the salary of citizens working in the private sector. Needless to say, with so many people working in the public sector at high wages, it is difficult to have a diversified private sector. Finally, growth is volatile because very few of these commodity-dependent countries have fiscal rules for managing price fluctuations. When the price of oil, say, rises, it is difficult for an oil exporter to resist the temptation to spend (and run fiscal deficits), which means that when the price falls, the countries have to tighten their belts and experience even slower growth. KABUL, Afghanistan (AP) — When the spokesman for an Afghan government ministry was asked why he wasn’t answering his phone, he said he was on strike as he hadn’t been paid for nine months. One official responsible for monitoring corruption resigned after a year, saying he was being ordered to bend the rules for the associates of senior politicians. Some officials have resorted to social media to embarrass the government of President Ashraf Ghani. The former head of Afghanistan’s spy agency, Rahmatullah Nabil, announced his resignation via a Facebook post in December. Weeks earlier, an official in Helmand warned on the social networking site that Taliban militants were poised to overrun part of the province. He said that he had failed to get a response when he tried to contact authorities through conventional channels. Afghanistan’s government is in disarray. Following bitterly fought and inconclusive presidential elections in 2014, Ghani and Chief Executive Abdullah Abdullah are sharing power under a deal brokered by U.S. Secretary of State John Kerry. But the country’s so-called unity government is proving anything but unified. Under the deal, Abdullah’s role as chief executive was to segue into a prime ministerial role, a first for the young democracy. The smooth transition of power from former President Hamid Karzai to Ghani was hailed as a sign of Afghanistan’s acceptance of the international community’s democratic project that followed the U.S. invasion and toppling of the Taliban. While some predict the government could collapse due to widespread corruption and administrative incompetence, officials and diplomats say there is simply no alternative. “There is no plan B, they have to make it work,” said a European diplomat in the Afghan capital, Kabul, speaking on condition of anonymity as he was not authorized to speak publicly. The national unity government agreement expires in October, when parliamentary elections are due to take place, though many observers believe the vote will be postponed until next spring because promised electoral reforms have not been implemented. Whether it is a wealthy entrepreneur or a drug trafficker, the tricks used to make their affairs hard to trace are pretty similar. It all starts by incorporating a "shell company" (or a "letterbox company") in an offshore tax jurisdiction, using the services of a law firm such as Mossack Fonseca. These companies have the outward appearance of being a legitimate business but in reality are just empty shells. They manage the money they receive and hide who owns it. The management is made up of lawyers and accountants, whose only role is to sign documents and allow their names to appear on the company's letterhead. 1. First it is to thank you for your kind invite to Lecture on Legal Challenge posed by Marshal Islands in International Court of Justice, which was followed as usual by High Tea. 2.Lecture by Prof Eirickson was salient for India to reckon with. He has been Iceland Ambassador to India and is now teaching at Jindal Law College. He is an Engineer + Law and much more. It was a very clever and subtle Lecture to influence the young minds from his Class plus local Law Students. 3. His outline was very clear to brainwash Indian mind to accept the verdict of ICJ. Introduction [ Background--NPT & Nuclear Weapons Advisory Opinion] ++++Preliminary Remarks++++Submission and Arguments of the Parties++++Conclusion. 4. Please recall Bipartisan US Domestic Commitment which was tackled by Bill Clinton, George Bush and Barak Obama, with different tactics. US was surprised by Nuclear Explosion by Atal Bihari Vajpaie!!!! To cap Indian Nuclear Weapon Programme and roll it back. This domestic aim has not changed. To conclude Civil Nuclear Energy Programme, the Weapon Count and military Plants were limited to tackle India's Nuclear Weapon Friends--Pakistan and China. China has already overshadowed India's limit by increasing Pakistan Nuclear Weapon Capacity plus added Tactical Nuclear weapons to nullify India's 2X Cold Front Start Doctrine. Plus India's Civil Nuclear Programme is being delayed on one account or the other and India is being held responsible. 5. So Marshal Islands Claims have been raised in ICJ in a very contrived way. There are 9 Nuclear Weapon States--P5+ India+Paksitan+N Korea+???? ===6 States including China do not accept Jurisdiction ICJ Jurisdiction. That leaves UK+India+Pakistan. UK is a signatory to NPT, India is compliant without acceding to it. Pakistan will not India signs. It is common knowledge that S Korea is one week away, Japan is 6 months away if America gives permission. Israel is its own jurisdiction. Iran and Syria have been disabled. S Arabia is a Nuclear Power by Proxy. So India remains the number one Target of P 5 and to achieve that they would do what ever it takes. 6. Marshal Islands and other Polynesian Islands took 1.2 Billion US Dollars from France and another 750 Million Dollars from US for conducting nuclear Tests in their waters. All 3 have no connection as such but India must sign NPT. Ingenious!!!! This is a Left Hook to divided India. One never knows a corrupt and divided India would fall or fail!!! 8. India and Pakistan have more or less same approach. Their stand -- it is for Self Defence and belongs to Domestic Arena over which ICJ has no Jurisdiction. Now the big Nuclear Weapons would keep at India from all Directions including FDI, Technology Transfer, Concluding pending Agreement with Pentagon for which Defence Secretary is coming 10 April for Defence Cooperation. 9. Russia's and America's Major number of Nuclear Tipped Missiles are locked against each other which have to overfly Iceland and Greenland so why these two countries are not asking US and Russia to disarm totally. India was also blackmailed to stop 1971 War with Nuclear Threat when both Soviet Union and US forced India to stop in its Tracks on West Pakistan Front. 10. Why Australia is shying off from accepting Climate Change Refugees from Ocean Island Countries when EU is taking 2 Millions Refugees. Why India which would have to resettle nearly 2 Million of its own Coastal Refugees ++ Bangladesh ++ Sri Lanka ++ Maldives, would keep coming. Should India stop developing and alleviating poverty, etc. To add to this West is unwilling to fund Climate Change Refugee Fund when it is primarily due their over consumption causing Global Warming. 11. Following Edwina Mountbatten's lead in 1948 advising Panditji to take the Kashmir to UNO, Prof Gudmunur advised India to go through ICJ proceedings-India would win and world would celebrate this International Rule of law. Hopefully, Indian Leadership does not fall into this clever Trap again!!!! 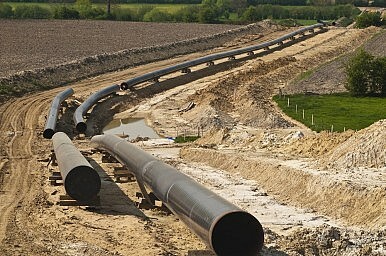 Is the TAPI Pipeline ‘Doable’? The Asian Development Bank thinks so. The Asian Development Bank this week oversaw the signing of an investment agreement among the four partners in the much-discussed Turkmenistan-Afghanistan-India-Pakistan pipeline. The four agreed to invest an initial budget of more than $200 million. This [the $200 million investment] includes funding for detailed engineering and route surveys, environmental and social safeguard studies, and procurement and financing activities, to enable a final investment decision, after which construction can begin. Construction is estimated to take up to 3 years. For years TAPI has been spinning its wheels, with the partners making periodic updates and statements which are a simple simulacrum of progress. “I agree … we’re going through some of the toughest territory in Afghanistan,” said [O'Sullivan], a transaction adviser for the project. Forget Twitter wars with hard-core extremists—the U.S. is going after jihadis the same way Amazon targets your shopping habits. The Obama administration is launching a stealth anti-Islamic State messaging campaign, delivered by proxies and targeted to individual would-be extremists, the same way Amazon or Google sends you shopping suggestions based on your online browsing history. At least that’s the plan, revealed Monday, of new anti-ISIS message czar Michael Lumpkin, now that the White House has put the ink to the final legal measures establishing the Center for Global Engagement, which replaces previous less-than-successful efforts. The new executive order (PDF) expands what Lumpkin can spend, who he can hire, and which parts of the U.S. government he can pull into the new campaign. The idea is to give local nonprofits, regional leaders, or activists invisible financial support and technical expertise to make their videos or websites or radio programs look and sound professional—and let them own and distribute the message. The center will also employ data analysts who will work with private industry partners to sift through the public information any user leaves on social media, to determine who might be leaning toward radicalism and message them directly—though how isn’t clear yet. Lumpkin is a former Navy SEAL who has political capital to spend after running special operations at the Pentagon since December 2013 and managing successful Joint Special Operations Command raids and the occasional drone strike in Syria and Libya, among other tasks. He has been blunt in his critique of the previous messaging efforts by the much-maligned and now defunct Center for Strategic Counterterrorism Communications. Check the most recent RT (Russian TV) news coverage from Syria and you will see Moscow’s latest military hardware on display. Russia’s top of the line attack helicopters—the Ka-52 and MI 28N—remain a fixture on the battlefield even after President Vladimir Putin’s nominal declaration of a Russian pullout. Beneath the ostentatious display of shiny new hardware there are questions U.S. policymakers want answers to in order to understand Russian intent. How has the price of oil affected Putin’s string of 16 years of military budget increases? What is the state of Russia’s conventional and nuclear forces in light of recently announced military budget cuts? The recent drop in oil prices and the subsequent affect on Russia’s state revenue suggests a reexamination of Moscow’s modernization ambitions. Dmitry Orenburg, a senior research scientist at CNA, told the Cipher Brief that the Kremlin has largely insulated the military from deep budget cuts. The recently announced five percent cut to the military’s budget is expected to affect procurement of new weapons and systems rather than Russia’s ability to conduct foreign operations or military exercises. However, the Kremlin has set strict deficit restrictions on how much debt it is willing to incur. The fat left to trim has its limits, therefore, any further decrease in oil prices could force the military to start making capability cuts rather than just ones to procurement. Not all consequences from the recession are negative. Orenburg points out an interesting side effect of the Russian recession: recruitment rates for the military have increased dramatically as the economy continues to shed jobs. The budget cuts have yet to put serious restrictions on Russia’s strategic nuclear forces. New ballistic missile submarines are entering service and a replacement strategic bomber is on the drawing table. While both have suffered budget-related delays, other platforms will step in to take up the slack. A new order for updated Tu-160 Black Jacks, a supersonic bomber capable of carrying nuclear missiles, will pick up the slack until the replacement bomber becomes a reality. Russia is replacing nuclear weapons in these systems, some with multiple warheads known as MIRVs. Strategically, MIRVs are most useful as a first strike weapon than as a deterrent. Strategists contend that the concentration of several warheads on one missile fosters a “use it or lose it” mentality in the event of nuclear war. While the U.S. has removed MIRVs from all of its land-based intercontinental ballistic missiles (ICBMs), Russia has not. Included in the Russian modernization plan (and the U.S.’s) are upgrades to tactical nuclear weapons, that is shorter range, lower yield, battlefield weapons. These devices blur the line between conventional and nuclear armed forces, and could diminish the symbolic power of nuclear weapons as an existential last resort. Further complications stem from the fact that the U.S. is not clear about how Russia intends to use these weapons or even how many they may have. Armenia and Azerbaijan have announced a truce after three days of fierce fighting in the secessionist region of Nagorno-Karabakh, but the flare-up is proof that the post-Soviet frozen conflicts are not really frozen. At any moment, they can be ignited by the realignment of international alliances and loyalties, and people will start dying again.There are four post-Soviet frozen conflicts. Three smolder around the Black Sea: Transnistria, a separatist region of Moldova, the Georgian regions of Abkhazia and South Ossetia, and, since last year, eastern Ukraine. The first two started in the early 1990s, the third one in 2014, as Russia attempted to destabilize an anti-Moscow government in Kiev. The Nagorno-Karabakh conflict, a territory disputed by Armenia and Azerbaijan, is the oldest. In 1988, the legislature of this region of Azerbaijan, populated mostly by ethnic Armenians, voted to secede and join Armenia. That country's current president, Serzh Sargsyan, was among the local activists pushing for such a move. Azerbaijan objected and fought a bloody war against Armenia, marked by massacres as both sides attempted ethnic cleansing, the interference of Soviet troops on the Azeri side and the participation of ferocious volunteers from the Russian part of the Caucasus. Armenia won the war, and by the time an internationally brokered cease-fire came into effect in 1994, Nagorno-Karabakh had an almost exclusively Armenian population and was run by a pro-Yerevan government. About 1 million people were displaced.The cease-fire has held for more than two decades despite intermittent border clashes. It's not clear who started the hostilities last weekend that caused dozens of casualties on either side: Armenia and Azerbaijan blame each other. Last fall, Azerbaijan's foreign minister, Elmar Mammadyarov, threatened to attack Nagorno-Karabakh unless Armenia unconditionally withdrew its troops. Azerbaijan's new decisiveness may stem from the open backing the Muslim country receives from Turkey. Recep Tayyip Erdogan, the Turkish president, has vowed to "support Azerbaijan to the end." This isn't just words: Since turning into a bitter enemy of Russian President Vladimir Putin of Russia after Turkey downed a Russian warplane on the Syrian border last year, Erdogan is eager to let Putin know that he's not afraid. Armenia is a close ally of Russia, part of its flailing Eurasian Economic Union with several other post-Soviet countries, but it's not Russia itself, making it a tempting target for Erdogan. Putin hasn't come out unequivocally in support of Armenia, instead calling on both sides to respect the cease-fire.Azerbaijan, however, cannot afford to break away completely from Russia and join Turkey's orbit. Its traditional economic ties with Moscow have weakened, and it does more trade with the U.S. and major EU countries, but Russia could be a fearsome enemy. So Azerbaijan is hoping for a negotiated solution to the conflict that would curb Armenia's gains. The recent ISIL (Islamic State in Iraq and the Levant) attacks in Belgium were a wakeup call for security forces and intelligence agencies throughout Europe. Belgium was shaken and went on high alert in the wake of the November 2016 Paris attacks when it was discovered that the source of the planners and attackers were in Belgium. This was not surprising as many had long criticized Belgium for a dysfunctional counter-terrorism policy that created a de-facto sanctuary for Islamic terrorists. The recent Belgium attacks were also organized in Belgium and now Belgium is under even more pressure to clean up its mess. But other countries have checked and found that, despite their own energetic counter-terrorism efforts it often wasn’t enough. France, for example found that in the last year the number of suspected Islamic terrorists had risen 50 percent to 8,250. Worse, the French admitted they had problems with some Moslems in their own security forces. France had identified 17 M0slem policemen who had been radicalized since 2012. It was already public knowledge that by early 2015 at least ten Moslem French soldiers had deserted and joined ISIL in Syria. Some of these deserters have since been identified as training other terrorists in skills they learned in the French military. One of these deserters had risen to a leadership position in ISIL. The problems with radicalized police were worse because police have access to police databases containing information about terrorism suspects, counter-terrorism tactics and ongoing counter-terrorism operations. Not all the details of this Islamic terrorists infiltration of the security forces has become public and it is believed there is more of it and the French are, for obvious reasons, not revealing exactly what they are doing about it. Britain and Germany have similar problems and at one point it was noted in the British media that more Moslem men of military age were joining Islamic terrorist organizations than were joining the British military. In the wake of the 2005 Islamic terrorist bombings in Britain a survey of British Moslems was conducted. Not surprisingly 88 percent of the million Moslems in Britain were either hostile or unsympathetic to Islamic terrorism. But 24 percent has some sympathy for the motives of the terrorists (“defending Islam” and all that) while six percent believed the Islamic terrorist violence was justified. More troubling was the 18 percent of British Moslems who felt little loyalty towards Britain and instead believed “Islam” was where their main loyalty was. Islam stresses this in its scripture. While non-state actors today are not on par with nation states as far as cyber capabilities are concerned, terrorist groups, criminals, hackers and the like could possess destructive capabilities enjoyed by a small circle of nations in the not-so-distant future. According to Adm. Michael Rogers, commander of the U.S. Cyber Command, non-state groups using cyber as a weapon system to inflict harm is one of the things that keeps him up at night. “The challenge I look for or that concerns me when I look at the future is what happens if the non-state actor – [ISIS] being one example – starts to view cyber as a weapon system? That would really be a troubling development,” he told lawmakers April 5. Rogers added that destructive cyber capabilities are not beyond the ability of groups such as ISIS or al-Qaeda if they made that decision. Ash Carter’s bold step of opening the Pentagon’s unclassified websites to hacker attacks –HackerOne — deserves coverage. We held off on reporting about the Pentagon’s new effort to encourage hackers to help the US military until we got an assessment from someone whose judgment we trust, with experience in the darkest corners of the cyber world. Why does this matter so much? “The existing system is incapable of giving him a complete view of the Department’s cyber risk and, realizing that in-house processes cannot solve the problem, he is turning to industry and the hacker community to provide an orthogonal view to the Pentagon’s cyber posture,” writes John Quigg, former Army cyber warrior who is now senior advisor to Spurrier Capital Partners, a New York investment bank. What’s the state of the Pentagon’s ability to manage a cyber attack? The Government Accountability Office just issued a report about the military’s ability to support civil authorities during a serious cyber attack. Its conclusion: the roles and responsibilities and the chain of command are unclear. In a domain where reactions must sometimes occur in seconds or minutes, an unclear chain of command does not increase confidence. So will HackerOne help fix this? Will this mark a turning point in the security of the unclassified networks upon which the Defense Department depends so much? Could it actually mean a less safe enterprise? After all, these hackers will be probing for weakness. Those units need computing power as soon as they land. But in order to maintain maneuverability, they need to keep light. But computing at the tactical edge is challenging even for the smartest of smart mobile devices. Connectivity there is often intermittent, and computers that are small enough to be highly portable lack the computing power and battery life needed for intensive data crunching. Cloud computing relies on applications, storage, and computing power that resides not on limited local machines, but on networks of much more capable servers. Clouds enable “thin clients,” such as handheld devices with limited computing power, to tap into much greater computing capabilities via the Internet or other networks. Clouds work wonderfully well – until you get close to the tactical edge. In hostile environments such as battlefields and disaster zones, mission requirements change rapidly and the need for computing power is great, but communication is likely limited and access to a cloud is problematic. Not so with cloudlets – they deploy with the troops. They’re just what their name implies – little clouds. They’re comprised of servers and communications gear engineered into small enough packages to be carried to the tactical edge. To be most useful in combat, cloudlet components should be able to fit into a backpack, Bible said. When deployed, a cloudlet would create a “communications dome” that stretches out 20 kilometers to 30 kilometers to provide cloud computing capability for “a company-level team” of up to nearly 200 troops, he said.